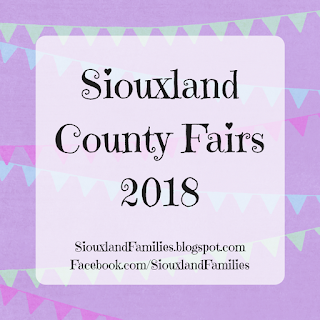 From the animals, interactive fun, and live entertainment to the glory and defeat from entering competitions, county fairs are one of the best parts of late summer around Siouxland! If you live in Sioux City, our county fair, the Woodbury County will be August 1-5 in Moville. 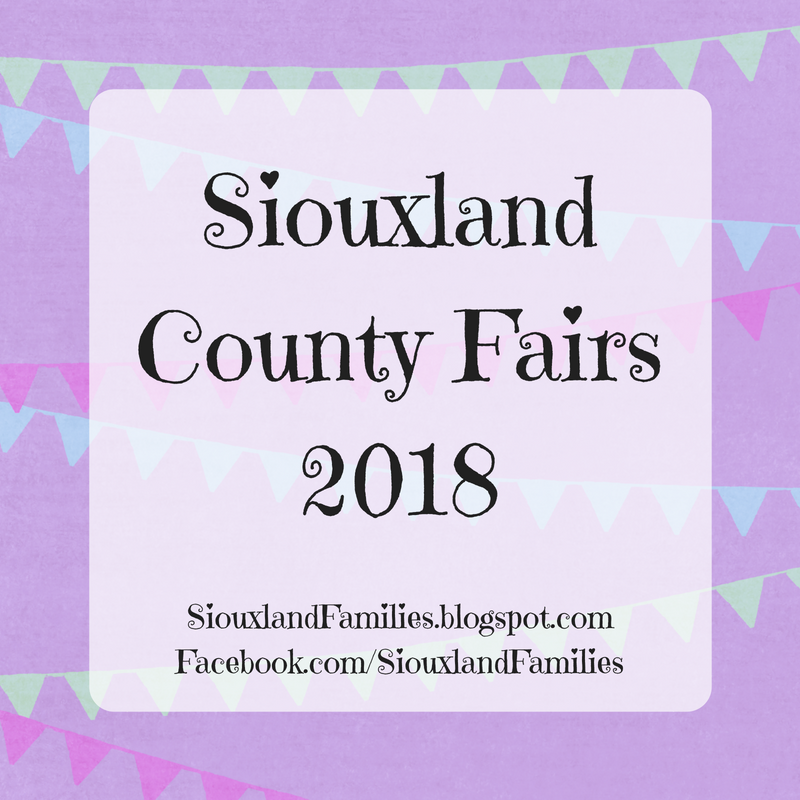 You can find more info in my 2018 Woodbury County Fair post. Here's the scoop on as many other nearby fairs as I could find details for, divided by state and then put in alphabetical order. This post will be updated frequently throughout the summer as more details become available. If you are affiliated with a county fair and have info to share, please e-mail me so I can include it! Highlights: Casey Muessigmann, Cherokee Can Chase, Tractor and Truck Pull, Demolition Derby, Bill Reilly Talent Show, Kids Day, and more! Highlights: Truck and tractor pull, Figure 8 races with fireworks to follow, horse show, dog show, rodeo, family fun night, ag-lympics, and much more! Highlights: Figure 8 racing, gospel concert, carnival, animals, exhibits, Fair Queen competition, and more! Highlights: Tractor Pull with fireworks to follow, Fair Queen and Little Princess contests, Bill Riley Talent Show, Giant Yard Games, kids crafts and activities,Cowbell 5k, parade, live music, food, and more! Highlights: Casey Muessigmann, petting zoo, auto races, Bill Riley Talent Show, fair dance, Fair Queen competition, rides, kids events, and more! Highlights: Figure 8 races and Demo Derby with Fireworks to follow, dog fashion show, tractor pull, cow pie bingo, pro wrestling, monster trucks, bbq cookoff, and more! Highlights: Jason Pritchett, Bull Riding, Tractor Pull, Demo Derby, Los Moralitos Circus, Surf City Allstars, Figure 8 Racing, Impact Pro Wrestling, Tuff Truck Contest, Divas through the Decades, Hypnotists, singers, and other live entertainment, animals, rides, food and more! Highlights: Tractor pull, Sioux Speedway, live music, and much more! Highlights: Chris Lane concert, tractor pull, car racing, roping, and much more! Highlights: Donkey Polo, Demo Derby, Mutton Bustin', live music, magic show and much more! Highlights: Concerts from Scotty McCreery, Chris Lane and Dylan Bloom, demo derby, ranch rodeo, food, kids activities, and much more! Highlights: Lonestar, Dylan Bloom, Bull riding, demo derby, ATV pull, Wildlife Encounters, Juggling, polka music, and much more! Highlights: Jaripeo (Mexican style bull-riding), escape room, tractor pull, pro wrestling, dueling pianos, parade, kids activities, laser tag, barrel racing, Fair Queen and Princess competitions, and much more! Highlights: Tractor pulls, demo derby, petting zoo, karaoke, gospel concert, kids activities, carnival, fair food, and much more! Highlights: Bull-a-Rama, live music, tractor pulls, pro wrestling, BMX bike show, and much more! Highlights: Barrel racing, pancake breakfast, Nebraska Bush Pullers, Cat show, horse show, bull riding, Casey Donahew, Pedal Pull, demo derby, and much more! Highlights: Demo derby, carnival, teen dance, team roping, wine tasting, and much more! Highlights: Truck and tractor pull, carnival rides, live music, demo derby, kids activities, and much more! Highlights: Demo Derby, inflatables, donkey races, car show, lawn mower races, barnyard Olympics, and much more! Highlights: Scotty McCreery, Trace Adkins, Michael Ray, Josh Turner, Casey Donahew, Hairball, Gabriel Iglesias, Barnes PRCA Rodeo, kids zone, and much more! Highlights: Tractor pull, live music, pancake breakfast, 4-H exhibits, and much more!